The natural characteristics which make the dog so perfectly adapted to life as a pack animal, also govern its interaction with people. Thus, a dog is able to subordinate itself to an individual in the pack who enjoys higher status than itself. And so it is that , as the dog's owner, you are now its pack leader. 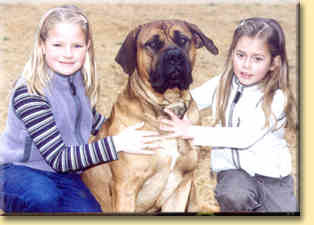 I have Veterinarian Certificates on the temperament and mental stability of each of my boerboels. The temperament tests are done every six months. The ideal age to introduce a puppy into your home is when it is ten weeks old. It is at this stage of their development that young animals learn most quickly and certain vitally important behaviours are imprinted indelibly on their minds. For example, you will be imprinted in the puppy's mind as its pack leader and your home as its environment. A puppy will also adapt more easily and quickly to its new surroundings at this stage than if it were older. For the first two months, all you need to teach your dog is to respect the word 'no' and its name. You can also begin house training. However, during the first two months, the most important things are to see that your puppy gets lots to eat and drink, sufficient sleep, lots of human company, plays a lot and gets plenty of exercise. Always talk to your dog in a quiet tone; a command in a loud voice should be the first degree of punishment. If you constantly shout at your dog, you will not have a more obedient dog - all the shouting will merely blunt its perception. Commands must always be brief, clear and expressed using the same words. Only then can you be sure that your dog will understand them. Although it is not clear whether dogs recognise the words themselves, they do register the rhythm and cadence of your speech. It is a good idea to accompany each word with a specific gesture so that later, your dog will be able to obey your commands at a greater distance and without words. Praise your dog lavishly whenever he obeys you. Punish it only when absolutely necessary and never punish it harshly. As already mentioned, the first degree of punishment is a loud voice. Your dog will readily recognise the change in your tone of voice and the raised voice will tell it that it has done something wrong. The next degree of punishment may be with a folded newspaper or small twig. These both make a characteristic sound which will be linked in your dog's mind with his having done something wrong. As your dog matures, there mere rustle of the newspaper will be enough to alert your dog to its wrongdoing. Never, under any circumstances, should you hit your dog with either its lead or your hand. He must always have absolute trust in both these objects!